Turkey burgers don't have to be bland! And it's not just the pineapple that makes these turkey burgers so flavorful and juicy! In a large mixing bowl, combine the ground turkey with the soy sauce; mix well. Form into patties as small or big as you like. Season each patty with a dusting of salt and pepper on each side. You can do this while they’re on the grill if it’s easier. Place each burger on the grill. Flip each burger after 4-5 minutes (could be longer or shorter depending on the thickness or if you’re cooking from frozen) and add cheese to the cooked side. Note: ground turkey is done when the thickest part of the meat has reached 165 degrees. Place the slice of pineapple on the gril and flip after a couple minutes. 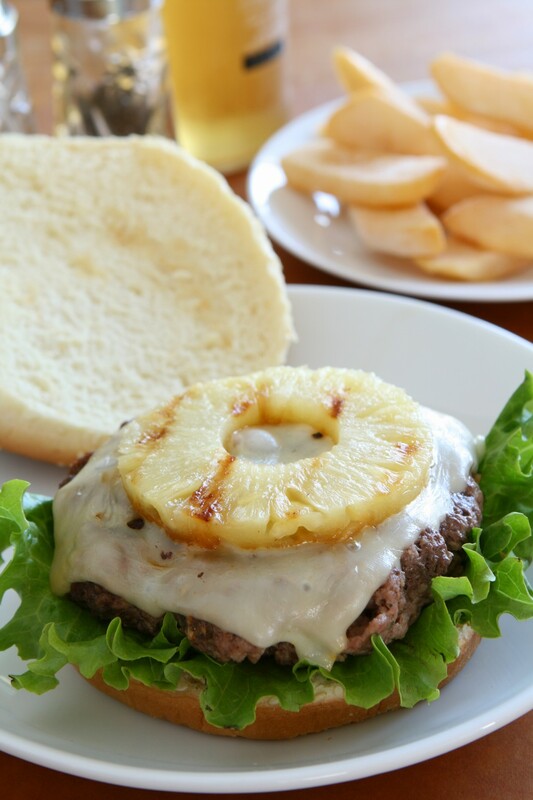 Once the burgers are done and the cheese is melted, place directly on the bottom of a bun and top with a slice of pineapple. Top with additional toppings/condiments as desired.